The Foster Upholstered Single Guest chair makes waiting comfortable with its webbed seat suspension and sturdy steel construction. NOTE: Orders less than $5,000 list are shipped at a flat rate of $125 net. 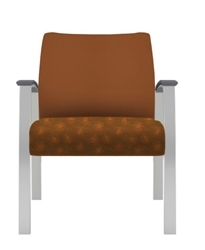 Overall: 34"H, 26"W, 24.75"D; Seat: 18"H, 21"W, 19"D; Back: 16"H, 21"W; Arm: 26.25"H; Warranted for users up to 500 lbs. 200+ textiles to choose from; COM Seat – 1 yard; COM Back -1.5 yards; COM Closed; Arms -0.75 yards; Note: When graded in combination upholstery is selected, pricing defaults to the highest grade upholstery selected.